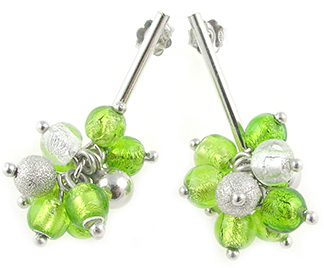 .925 Sterling Silver drop earrings with authentic Murano Glass beads of peridot yst over .925 Sterling Silver foil. Earrings hang about 1 1/2 inches with a sterling silver post and sterling silver clutches. Very popular style of earrings with the cluster of 6mm beads.